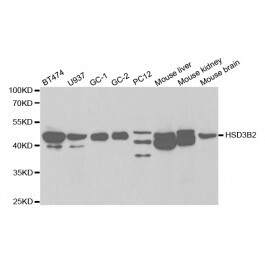 Rabbit anti Human, Mouse 3-beta HSD2 / HSD3B2. 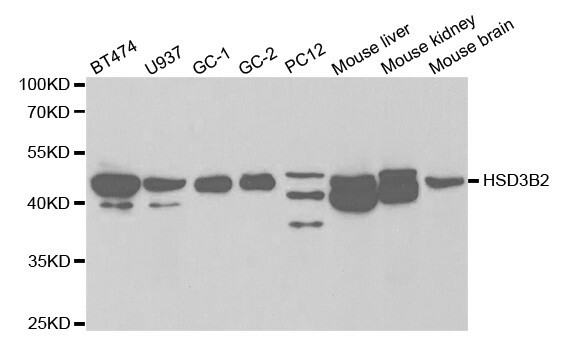 Recombinant protein of human HSD3B2. The protein encoded by this gene is a bifunctiol enzyme that catalyzes the oxidative conversion of delta(5)-ene-3-beta-hydroxy steroid, and the oxidative conversion of ketosteroids. It plays a crucial role in the biosynthesis of all classes of hormol steroids. This gene is predomintly expressed in the adrels and the gods. Mutations in this gene are associated with 3-beta-hydroxysteroid dehydrogese, type II, deficiency. Altertively spliced transcript variants have been found for this gene. Store at -20°C (regular) and -80°C (long term). Avoid freeze / thaw cycles. Buffer: PBS with 0.02% sodium azide, 50% glycerol, pH7.3.